There are those that believe Vikings were savages that raided civilized nations and yet others who are of the opinion that they were explorers and traders who possessed advanced skills in seafaring. Whatever opinion you have Vikings Go Berzerk (Yggdrasil) gives you the opportunity to see how these Norse seafarers behave when they get angry. You don't have to be in fear though, because the more enraged they get, they better an advantage it is for you. In Vikings Go Berzerk there is so much action leading you from one surprise to another, even after spinning the reels for hours. Following an intro video that is nothing short of amazing, you will be ushered into what seem like a zillion features, packed with fun and well paying, too. The Vikings Go Bezerk game has 25 paylines and 5 reels which are blended wonderfully in a thematic wagering menu bar. However, you will not be able to make any alterations with regard to line numbers as you place your bets, although you can flick your wagers around to a certain extent. Expect to place wagers starting from a minimum of 0.25 coins per spin to a maximum amount of 250. There is also a list of standard features such as Wilds and Free Spins, but there is no multiplier. The coin values available range from 0.01 to 5 which means that each spin adds up to a minimum of 0.25 to a maximum 125 coins per spin. You will also find Vikings standing below the reels and directly underneath them their individual Rage meters; filling any of the meters will trigger a special feature. However, before you get the Vikings raging, check out the two game-facilitating functions: The Max Bet and Autoplay buttons. The Max Bet button gives you the chance to stake the maximum amount with a single click, and the Autoplay feature allows you to play up to 1000 spins automatically. RTP of the video slot is a little over 96% making Vikings Go Berzerk a medium variance game. There are numerous bonus features, and it is recommended to check the pay table to get an understanding of what is going on. The Wild symbols are denoted with the word “Wild”. These Wilds can substitute every other symbol with the exception of the Scatters. The Vikings also become Wilds but only when the bonus feature is triggered and this too is under specific conditions. If you land three or more scatters on an active reel, you will successfully trigger a Ragnarok bonus round. This bonus round forms the main special feature and comprises of free spins as well as other great things. The Ragnarok bonus can also be triggered via the Rage Meter which is located right above the reels. Whenever you accumulate a Viking win you will see the Rage Meter rising. Once the meter is full; you will be taken straight to the bonus game. The Viking Berzerk mode strengthens the Vikings making them more capable of defeating the sea monsters and thus creating more Wilds. 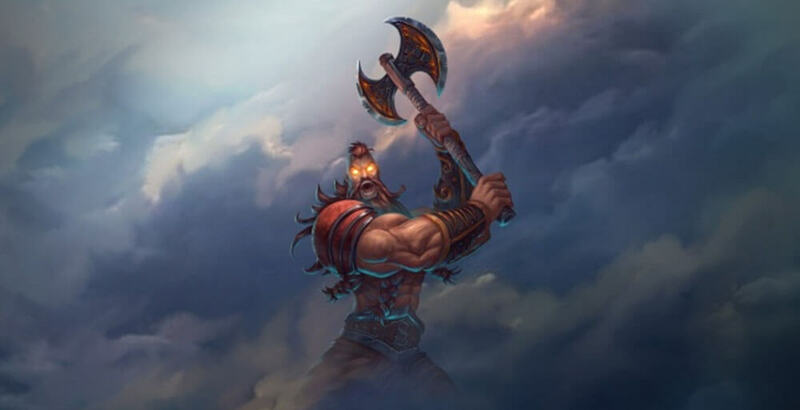 You can make the Vikings go berserk by either activating the Ragnarok Free Spins or charging their individual rage meters. 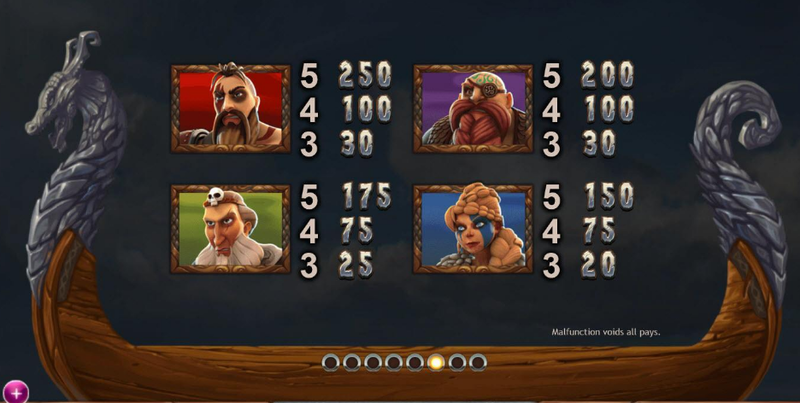 Rage meters will fill up after getting a winning combination that includes at least one Viking symbol. 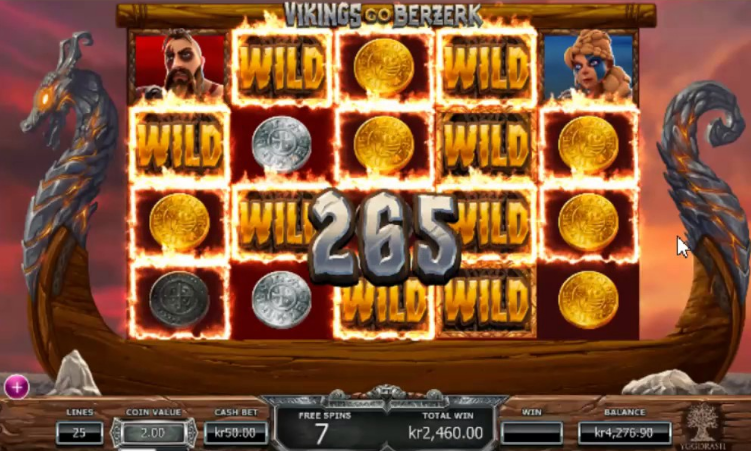 Once the meter is full, you will be awarded 7 Free Spins when that Viking goes into Berzerk mode. The Welcome Rage ushers you into the game by pre-filling the rage meters by more than 50%. You will come to appreciate this free fill once you start playing the game and face the real challenge of engaging the Vikings. How you get to the free spins bonus round is not an issue really because the premise remains though the number of spins is different. When the Vikings appear, they will go into an apocalyptic battle with the sea serpents. When the Vikings win the battle, they will be turned into Wilds. If the sea creatures defeat the Vikings, then they Vikings remain in their original status. First, there is the Free Spin symbol where you can get awarded 3 + 21, 14, or 7 free spins. When this mode is activated, you will see sirens diving off the ship changing into sea monsters. The free spins round will also cause the Wilds to be sticky. The Vikings will land on the reels and start a battle with the sea monsters. Once the Vikings win, the monster symbols are automatically turned into Wilds. Before getting to the free spin mode, there is a random selection of one out of the possible five bonus features. The five bonuses include the Ragnarok Free Spins feature, a Starting Wild, an additional 1 to 3 Spins, a Starting Wild Reel, or the addition of 5 Treasure Chests as well as 5 Golden Treasures added to the reels. The second symbol that triggers the free spins is the Treasure Chest which you will see appearing on the 4th reel. This symbol will deliver either Free Spins or a coin win. The Free Spins given will range between 7 and 21 while the coins are anything from 50 to 1,000. If you land a treasure chest while already in free spin mode, you will get any one of the five featured prizes and these include additional free spins, up to 1,000 coins, and extra Wilds. The third Free Spins trigger symbol is the Golden Treasure Chest which you will see appearing on the 5th reel. This symbol will deliver free spins or coin win. The free spins given in this case are between 7 and 21 while the coins range from 250 to 1,000. The Golden Treasure Chest can also cause a boost in the Rage Meters of up to 25% more rage for every Viking. It can also award Ragnarok Free Spins. If you trigger the Golden Chest while on a free spins mode, you will be granted additional free spins, coin wins, or extra Wilds. During the Ragnarok Free Spins, all the Vikings are already raged and will turn Wild after successfully defeating the Sirens. You can win this feature by activating the bonus randomizer, or the Golden Treasure Chest. Vikings Go Berzerk is mobile optimised and supports Android and iOS platforms. The game volatility is rated as medium-high, and this means that long dry spells and a bit of discouragement can set in. The instant and most significant wins are delivered when the Treasure Chests appear. The standard Treasure Chest can award you with up to 1,000 coins, while the Golden Treasure Chest will pay you up to 10,000 coins. Another way to win is to get the maximum Free Spins number that has multiple Sticky Wilds, and keep your fingers crossed for the Ragnarok Free Spins that enrage the Vikings turning them into Wilds.